For a while, I was a tremendous Broadcast fan. The British duo's chilling combination of 60s lounge pop and fragile experimental ambient meanderings just did it for me. Somehow, though, their albums left my main computer, took up residence on my external hard drive, and haven't been seen for quite some time. 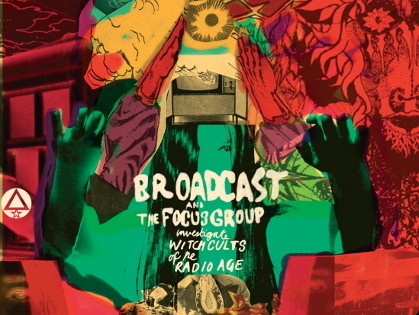 To my great excitement, though, their label, Warp, just announced the October 27 release of Investigate Witch Cults Of the Radio Age, an EP (at least that's what they're calling the 23-track disc) they created in collaboration with the Focus Group. Witch Cults could be Broadcast's most impacting and significant output to date for its sheer innovation, delicate composition, and wholly enchanting arrangement. You'll be more mesmerized than ever. For those of you who don't know the Focus Group, it's the musical project of U.K. graphic designer Julian House, who also just so happens to own the label to which he is signed, Ghost Box. House's stuff is really only similar to Broadcast's in terms of texture as the man doesn't sing or even attempt to compose pop songs of any variety on his own. However, he draws largely from the same influences and references: library music sounds, 1970s films and programs soundtracks, old synth warbles, and so on. (By the way―you've seen house's artwork countless times before: he's done covers for Stereolab, Oasis, the Prodigy, and, of course, Broadcast itself.) The official coming-together of Broadcast and the Focus Group was an absolutely genius move. Not only does it further cement each outfit's individual reputation for being spectacularly talented, but it also sets them up to impress the world as a unit that only gets better and more unusual, unique with time and assistance from friends. As usual, the songs are titled in a style typical only to Broadcast. Everything sounds like a half haiku or a line from a fairy tale that's been flipped and flopped just enough to change its meaning and make you give it a second look, a second think. Broadcast & the Focus Group - How Do You Get Along, Sir? Broadcast & the Focus Group - The Be Colony/Dashing Home/What On Earth Took You? They were removed by the powers that be. I sort of saw that one coming.